middle layer; and the pia mater is the vascular inner-most layer that adheres to the surface of the brain and spinal cord. Inflammation of the meninges is called meningitis. The type of meningitis contracted depends upon whether the brain, spinal cord, or both are affected, as well as whether it is caused by viruses, bacteria, protozoa, yeasts, or fungi. CEREBROSPINAL FLUID.Cerebrospinal fluid is formed by a plexus, or network, of blood vessels in the central ventricles of the brain. It is a clear, watery solution similar to blood plasma. The total quantity of spinal fluid bathing the spinal cord is about 75 ml. This fluid is constantly being produced and reabsorbed. It circulates over the surface of the brain and spinal cord and serves as a protective cushion as well as a means of exchange for nutrients and waste materials. Spinal Cord The spinal cord is continuous with the medulla oblongata and extends from the foramen magnum, through the atlas, to the lower border of the first lumbar vertebra, where it tapers to a point. The spinal cord is surrounded by the bony walls of the vertebral canal (fig. 1-44). Ensheathed in the three protective meninges and surrounded by fatty tissue and blood vessels, the cord does not completely fill the vertebral canal, nor does it extend the full length of it. The nerve roots serving the lumbar and sacral regions must pass some distance down the canal before making their exit. 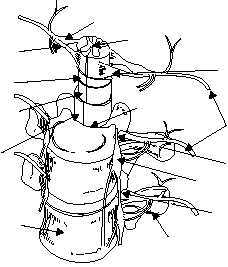 The sympathetic trunk contains the paravertebral ganglia (sing. ganglion), knotlike masses of nerve cell bodies (fig. 1-44). A cross section of the spinal cord shows white and gray matter (fig. 1-45). The outer white matter is composed of bundles of myelinated nerve fibers arranged in functionally specialized tracts. 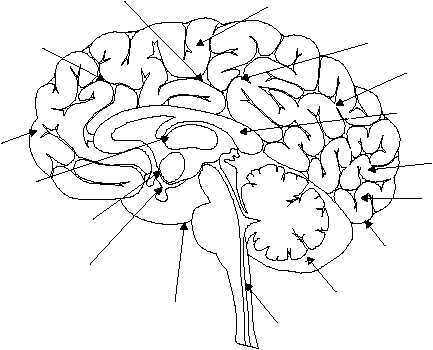 It establishes motor communication between the brain and the body parts. The inner gray unmyelinated 1-38 HM3f0143 MOTOR AREAS INVOLVED WITH THE CONTROL OF VOLUNTARY MUSCLES CONCENTRATION, PLANNING, PROBLEM SOLVING FRONTAL LOBE MOTOR SPEECH AREA (BROCA'S AREA) INTERPRETATION OF SENSORY EXPERIENCES, MEMORY OF VISUAL AND AUDITORY PATTERNS TEMPORAL LOBE BRAIN STEM VISUAL AREA VISUAL IMAGES, VISUAL RECOGNITION OF OBJECTS OCCIPITAL LOBE GENERAL INTERPRETATIVE AREA PARIETAL LOBE UNDERSTANDING SPEECH, USING WORDS SENSORY AREA INVOLVED WITH CUTANEOUS AND OTHER SENSES CEREBELLUM AUDITORY AREA Figure 1-43.Functional areas of the brain. HM3F0144 SYMPATHETIC TRUNK PARAVERTEBRAL GANGLION SPINE NERVES TRANSVERSE PROCESS INTERVERTEBRAL FORAMEN POSTERIOR ROOT DORSAL ROOT GANGLION PIA MATER ARACHNOID MATER DURA MATER VERTEBRAL CANAL BODY OF VERTEBRA ANTERIOR ROOT SPINAL CORD Figure 1-44.Spinal cord.